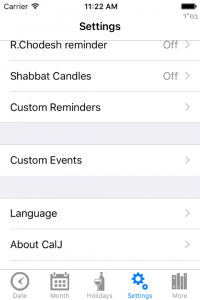 In CalJ for iOS you can add an Azcara (Yahrzeit) or a birthday reminder, that will pop up yearly on the Hebrew date of the event. In the Settings tab, section “Custom Events“, open My Events and you will see a [+] button at the bottom of the screen. You have to indicate the initial date of the event (birthday of passing away), including the correct year, and CalJ will calculate the yearly reminder for you. 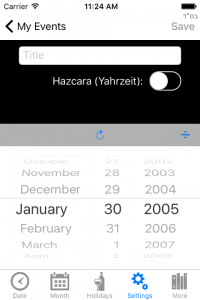 You can specify the origin date in either the Jewish calendar or secular calendar, by using the circular arrow button above the date picker. 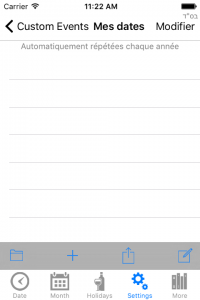 The “List My Events” switch lets you choose whether to show your anniversaries on the Festivals page. If you recorded many Custom Events, it could be useful to not show them on the list of festivals. 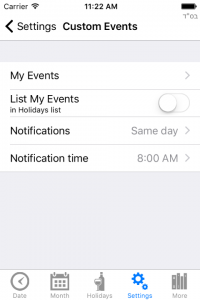 The custom anniversaries will show up anyway on the Date screen on the day of the anniversary, and the reminder alerts for the events is configured in the Notifications section on this screen, whether or not you chose to print your events in the festivals list. Please notice that the initial year of the event for which you record an anniversary, is important. The application deals only with anniversary commemorations, which means that the initial date (birth, petirah) will not be displayed. The event becomes visible only at the first anniversary date. ← How can I see the Zmanim in Rav Ovadia Yosef opinion?